The earliest known solar eclipse was recorded in the Chinese book Classic of History by "Ho and Hi, the Drunk Astronomers." Halley's Comet passed perihelion in its twenty-first known passage, as computed from records by Chinese astronomers. The College of New Jersey (later renamed Princeton University) received its first charter from King George II, under the seal of John Hamilton, Acting Governor of the Royal Province of New Jersey. 3,200 feet above Paris, Andre-Jacques Garnerin made the first recorded parachute jump. Andre-Jacques Garnerin was the first person to use parachutes regularly and successfully. The parachute was originally designed to enable people to escape from the early balloons during an emergency and to land safely. On 22 October 1797, he gave the first public demonstration of the parachute when he jumped from a balloon to show how the device worked. The semi-rigid parachute consisted of a white canvas canopy 23 feet in diameter with 36 ribs and lines, and looked like a very large umbrella. After ascending to an altitude of 3,200 feet (975 meters) in a hydrogen balloon, he jumped from the basket. Since Garnerin failed to include an air vent at the top of his parachute, he oscillated wildly in his descent. However, he landed unhurt half a mile from the balloon's takeoff site. Garnerin therefore demonstrated that a parachute was capable of slowing a man's fall from a high altitude. C. H. F. Peters discovered asteroid #209 Dido. The International Meridian Conference voted to adopt Greenwich as the Prime Meridian and established 24 global time zones of one hour each. Prior to the International Meridian Conference held in October, 1884, many different "standard" times were in use, kept variously by private firms (e.g., rail and shipping lines), local authorities, and national governments. Paris' official clock, for example, was nine minutes, twenty-one seconds ahead of London's, while halfway through the ninteenth century, one count found as many as 144 different official times being used in the United States. As ninteenth century "globalization" accelerated, brought on by submarine cables, telegraphy, interconnecting rail lines, and rapidly rising volumes of shipping, the lack of a unified time system meant confusion, missed connections (often in railway stations), and the risk of accidents when trains or boats using different "standard" times arrived simultaneously in ports and terminals. President Chester A. Arthur's called for an international conference in Washington to remedy the situation, to agree on what time it was and when the day began. The resulting International Meridian Conference met from October 13-22, 1884, and gathered 25 countries: Austria-Hungary, Brazil, Chile, Columbia, Costa Rica, France, Germany, Great Britain, Guatemala, Haiti (San Domingo), Italy, Japan, the Kingdom of Hawaii, Liberia, Mexico, Netherlands, Paraguay, Russia, Salvador, Spain, Sweden, Switzerland, Turkey (Ottoman Empire), United States, and Venezuela. Its result was the modern global time system: 24 world time zones an hour apart, and an international agreement that the international day would begin at midnight at the Greenwich Naval Observatory near London. Greenwich, the basis of British national time since the seventeenth century, was chosen for commercial and administrative convenience: Three-quarters of all international shipping used it already, and the United States had adopted it as well a year earlier. France, supported by Brazil and Haiti, argued for a "neutral" Prime Meridian somewhere in the middle of the Atlantic, and refused to adopt Greenwich time until 1911. When the final vote on the resolution was taken on October 22, 1884, France and Brazil abstained, San Domingo voted against it, and the twenty-two remaining countries attending all voted in its favor. M. Wolf discovered asteroids #459 Signe, #460 Scania, #461 Saskia and #462 Eriphyla. A. Kopff discovered asteroid #619 Triberga. E. Delporte discovered asteroid #1294 Antwerpia. E. Delporte discovered asteroids #1375 Alfreda and #1401 Lavonne. Chester Carlson performed the first successful experiment of the basic principles underlying the Xerox copying machine, transfer of an image using electrostatic charge. Y. Vaisala discovered asteroids #1473 Ounas, #1520 Imatra, #1521 Seinajoki and #2715 Mielikki. C. A. Wirtanen discovered asteroid #1600 Vyssotsky. M. B. Protitch discovered asteroid #2244 Tesla. H. L. Giclas discovered asteroid #2061 Anza. USSR launched Luna 12 on its mission to orbit the Moon. 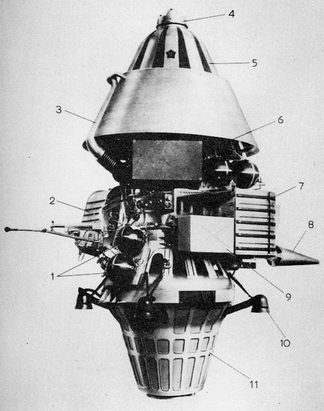 Luna 12 was a Soviet Lunar orbiter, launched towards the Moon from Biakonur via an Earth orbiting platform on 22 October 1966, which achieved Lunar orbit on 25 October. Its purpose was further development of artificial Lunar satellite systems, and conducting scientific experiments in circumlunar space. The spacecraft was equipped with a television system that obtained and transmitted photographs of the Lunar surface. The photographs contained 1100 scan lines with a maximum resolution of 14.9-19.8 meters. Pictures of the Lunar surface were returned on 27 October, and radio transmissions from Luna 12 ceased on 19 January 1967, after 602 Lunar orbits and 302 radio transmissions. T. Smirnova discovered asteroids #1774 Kulikov, #1854 Skvortsov, #2009 Voloshina, #2046 Leningrad, #2342 Lebedev and #2574 Ladoga. Apollo 7, the first manned Apollo mission, safely splashed down in the Atlantic Ocean after orbiting the Earth 163 times during its 11 day flight. Apollo 7 (AS-205), launched 11 October 1968, was the first crewed flight of the Apollo spacecraft, with astronauts Walter Schirra Jr, Donn Eisele, and Walter Cunningham on board. The primary objectives of the Earth orbiting mission were to demonstrate Command and Service Module (CSM), crew, launch vehicle, and mission support facilities performance, and to demonstrate CSM rendezvous capability. Two photographic experiments and three medical experiments were planned. The Command Module (CM), a cone-shaped craft about 390 cm in diameter at the large end, served as a command, control, and communications center. Supplemented by the Service Module (SM), it provided all life support elements for the crew. The CM was capable of attitude control about three axes and some lateral lift translation. It also served as a buoyant vessel at sea. The SM provided the main propulsion and maneuvering capability. It was jettisoned just before CM reentry. The SM was a cylinder 390 cm in diameter and 670 cm long. The spacecraft mass of 14,781 kg is the mass of the CSM including propellants and expendables. There was no Lunar Module or boilerplate unit on this flight. The countdown had proceeded smoothly, with only a slight delay because of additional time required to chill the hydrogen system in the S-IVB stage of the Saturn launch vehicle. After lifting off from Launch Complex 34 at Cape Kennedy, Florida, the S-IVB/CSM was put into a 228 x 282 km Earth orbit. Venting of the S-IVB propellants raised the orbit to 232 x 309 km over the next three hours, at which time the S-IVB stage was separated from the CSM. Although spacecraft separation was normal, the crew reported that one adapter panel had not fully deployed. The S-IVB stage was then used for rendezvous maneuvers over the next two days, as Schirra and his crew performed simulated dockings with the S-IVB stage, maneuvering to within 1.2 meters of the rocket. Shortly after liftoff, the commander (Schirra) reported he was developing a bad head cold. The next day, the other two crew members also reported symptoms. The zero-gravity environment exacerbated their ailments, since normal fluid drainage from the head did not occur. The crew took medication, but the colds caused them extreme discomfort throughout the mission, hampering performance of some of the scheduled duties. During re-entry, the astronauts also did not wear their helmets, to make it possible to properly clear their throats and ears. Many tests were performed over the course of the 11 day mission, including tests of sextant calibration, attitude control, evaporator, navigation, rendezvous radar, thermal control system, and Service Module propulsion systems. During eight burns of the service propulsion system over the course of the flight, the engine functioned normally. The seven television transmissions made from Apollo 7, commencing on 14 October, were the first live TV transmissions from a piloted US spacecraft. The S-IVB orbit decayed on 18 October, and it impacted the Indian Ocean at 9:30 UT. At 10:46 UT on 22 October, the SM was jettisoned, and re-entry of the CM and crew started 10 minutes later. Apollo 7 splashed down in the Atlantic Ocean on 22 October 1968 at 11:11:48 UT (7:11:48 a.m. EDT) after a mission elapsed time of 260 hours, 9 minutes, 3 seconds. The splashdown occurred at 27 deg 32 min N, 64 deg 04 min W, 200 nautical miles SSW of Bermuda and 13 km (8 mi) north of the recovery ship USS Essex. For nearly 30 years the Apollo 7 Command Module was on loan (renewable every two years) to the National Museum of Science and Technology of Canada, in Ottawa, along with the space suit worn by Wally Schirra. In November 2003, the Smithsonian Institution in Washington, DC, requested them back for display at their new annex at the Steven F. Udvar-Hazy Center. The Apollo program included a large number of uncrewed test missions and 12 crewed missions: three Earth orbiting missions (Apollo 7, 9 and Apollo-Soyuz), two Lunar orbiting missions (Apollo 8 and 10), a Lunar swingby (Apollo 13), and six Moon landing missions (Apollo 11, 12, 14, 15, 16, and 17). Two astronauts from each of the six landing missions walked on the Moon (Neil Armstrong, Edwin Aldrin, Charles Conrad, Alan Bean, Alan Shepard, Edgar Mitchell, David Scott, James Irwin, John Young, Charles Duke, Gene Cernan, and Harrison Schmitt), the only humans to have set foot on another solar system body (through 2014). C. Torres discovered asteroid #2013 Tucapel. USSR launched Cosmos 690 (Bion 2, Biocosmos 2) from Plesetsk for biomedical research. 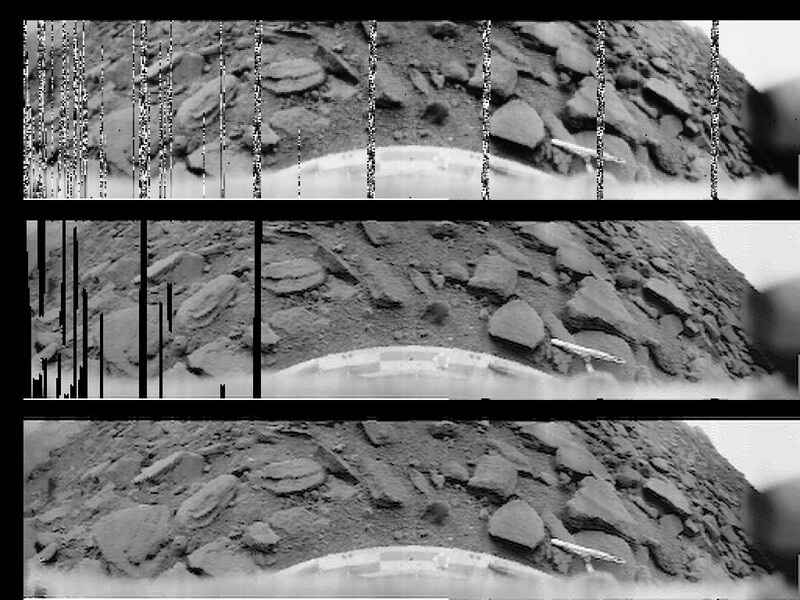 The Soviet spacecraft Venera 9 lander made a soft landing on Venus and transmitted data for 53 minutes, while the bus component of the probe went into orbit and became humanity's first Venus orbiter. USSR launched Venera 9 from Baikonur on 8 June 1975. The orbiter entered Venus orbit and was separated from the lander on 20 October 1975. The orbiter's mission was to act as a communications relay for the lander, and to explore cloud layers and atmospheric parameters with instruments including a French 3500 angstrom UV photometer, a 4000-7000 angstrom photo-polarimeter, a 1.5 to 3 micron infrared spectrometer, and an 8 - 30 micron infrared radiometer. The orbiter also carried a magnetometer and charged particle traps. Some reports indicated a camera system was also aboard. The orbiter consisted of a cylinder with two solar panel wings and a high gain parabolic antenna attached to the curved surface. A bell-shaped unit holding propulsion systems was attached to the bottom of the cylinder, and mounted on top was a 2.4 meter sphere which held the lander. C. Kowal discovered asteroid #2340 Hathor; H. Kosai and K. Hurukawa discovered asteroids #2271 Kiso and #2470 Agematsu; P. Wild discovered asteroids #2337 and #2989.
International Sun-Earth Explorers 1 and 2 were launched into Earth orbit. NASA launched STS 52 (Columbia 13) into orbit to deploy the Laser Geodynamic Satellite II (LAGEOS-II), operate the US Microgravity Payload-1 (USMP-1), and conduct other secondary experiments.